My second book by this American – Nigerian author having previously read Lagoon. 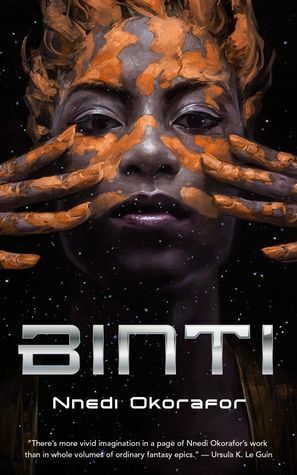 I loved the way she takes two ostensibly diverse topics namely African culture and SciFi , and creates a fusion genre. Why shouldn’t a Himba woman become a student at the most prestigious university in this futuristic universe? Would the same prejudices follow her from Earth into the far reaches? Be echoed in the attitude of other beings? Binti is the first Himba to attend Oomza Uni. Her family think it will change her. Other humans regard her (otjize) sweet smelling orange clay covered skin with disgust. They make her leave her bangles when boarding the space shuttle. From a family of harmonisers she uses her skill with mathematics and her particular cultural heritage to first survive a Meduse attack which wipes out the rest of the shuttle, then to mediate peace and create understanding where there had been none. Binti’s apparent differences in the end save her, humanity and their adversary, the Meduse. ashramblings verdict 4* I hovered between 3 and 4 stars, finally settling on 4 because I am so intrigues by the premis for this short novella and by the promise it holds of hearing more from this exciting voice.